Funeral services for Barbara Panter, 84, West Plains, Missouri, will be held at 10:00 a.m., Monday, January 21, 2019 in the Rose Chapel at Robertson-Drago Funeral Home. 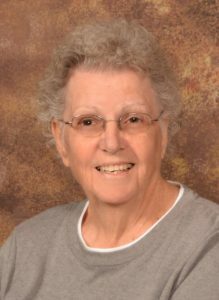 Mrs. Panter passed away at 1:32 a.m., Thursday, January 17, 2019 at Mercy Hospital, Springfield, Missouri. She was born December 9, 1934, at West Plains, Missouri, to Roy B. Downen and Stella Fine Downen. Barbara graduated from West Plains High School with the Class of 1953. She was married to C. W. Horn on November 10, 1954 and to this union two children were born, Anna Rebecca and Claud Ricky. On July 31, 1981, she was married to James Panter, who preceded her in death on October 11, 2015. Mrs. Panter was a homemaker and was the owner of Horn Plumbing for many years. She loved her family and enjoyed her garden and yardwork. She is survived by two children, Ricky Horn and wife, Debbie, West Plains and Becky Hudgens and husband, Tom, Biloxi, Mississippi; ten grandchildren, Jennifer Herron, Amanda Hudgens, Ashley Horn and husband, Jeff, Megan Schmitt, Josh Hudgens and wife, Donna, Stephanie Horn, and husband, Nick, Sam Hudgens, Matt Hudgens, Sarah Hudgens and Gabe Hudgens; ten great-grandchildren; one brother, Glen Downen and wife, Ina; one sister, Christine Brewer and husband, David; and many nieces and nephews. Her parents, husband, one brother Eddie Downen and twin sisters, preceded her in death. Visitation will be held from 6:00 until 8:00 p.m., Sunday, at Robertson-Drago Funeral Home. Burial will be in the Union Grove Cemetery. Memorial contributions may be made to Wolf Creek Primitive Baptist Church at Mansfield or Union Grove Cemetery and may be left at Robertson-Drago Funeral Home. So sorry for your loss. I miss seeing you guys but will always remember how kind you were to me. Prayers coming your way in this time of loss. We want to extend our deepest sympathy to you and your families upon the loss of Barbara. Your and your families will be in our daily prayers/thoughts. May God comfort, encourage, and support each one of you thru this difficult time. May God bless each one of you.